AFL CHIEF executive Gillon McLachlan has apologised on behalf of the code over a shocking crowd incident during Friday night's preliminary final between Fremantle and Hawthorn. "It was completely unacceptable and doesn't represent our game in any way, and I apologise on behalf of our game to our supporters that they are represented in that light," McLachlan said in Perth on Saturday morning. "I have to say personally when I see a man striking a women, it makes me incredibly angry." "I can't tell you how angry it makes me feel and I'm disappointed for our industry that I'm talking on an issue that is as outrageous as what happened last night," McLachlan said. Speaking under the pseudonym Sarah, the victim told Triple M on Saturday morning that she feared for her children's safety. She said her eight-year-old stepdaughter doesn't want to attend another game. "When he started walking towards me I just knew I had to stand between him and my kids and I said 'mate you need to just sit down, you're ruining it for the children here'," Sarah said. "He said 'I don't give an 'F' about your kids, I'll smash them too' and that's when he struck me in the throat. "Today obviously [the children] are quite shaken still but very pleased there's been so much support. "My eight-year-old step daughter will never go to the football again she tells us." Sarah also said there should be closer attention paid to how much alcohol fans consumed at the football. 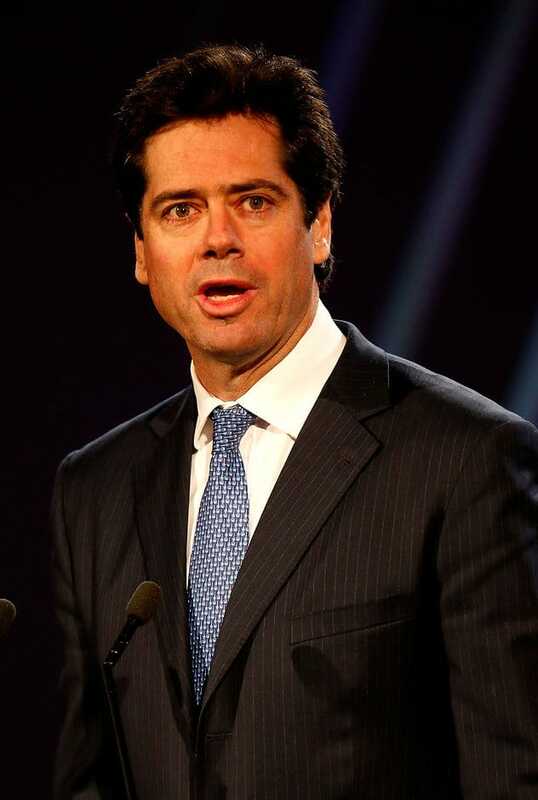 Fremantle CEO Steve Rosich echoed McLachlan's comments in a statement released later on Saturday. "I spoke to Gillon earlier today about the behaviour of the person concerned, which was deplorable and totally unacceptable," he said. "Whilst this incident occurred at Domain Stadium, it is not representative of our football club and not representative of our members and supporters. "We have the largest percentage of female members in the League and all women, along with everyone who attends our games and all AFL games, deserves to do so in a safe and friendly environment. "With respect to what action the club can take, we are awaiting a report from the stadium manger to assist in determining whether the person is a member." AFL boss Gillon McLachlan speaks to the media in Perth on Saturday afternoon. The incident was the worst of a number of incidents in the crowd at Domain Stadium. Two others involved fans interacting with Hawks players Isaac Smith and Luke Breust. A male Fremantle supporter gestured towards Smith in a threatening manner with his right hand, while a Dockers fan lashed at Breust with an inflatable anchor after he was slung into the boundary fence. A number of fans were evicted from the stadium, but officials couldn't confirm how many on Saturday morning. "I didn't like seeing fans leaning over the fence. We'll have to work through those," McLachlan said. The AFL chief said most of the crowd behaved as expected. "The vast majority of fans were loud passionate and vocal," he said. "I think Western Australian football supporters generally would be very distressed by what they saw last night, I thought the reaction of people around demonstrated that." McLachlan said club's had the power to revoke memberships of people misbehaving and encouraged Fremantle to do so.